Looking to add some boost to the height of your wakeboard or wakeskate tricks? Check out Fat Sacs wakeboard ballast bags. These ballast bags are easy to use and a great way to add extra weight to your boat to give you a bigger wake to launch bigger tricks. 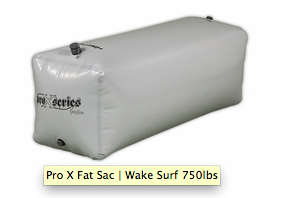 The Fat Sacs Wakeboard Ballast Bags are easy to set up and ready to use immediately. The ballast bags can be positioned to where you want to add extra weight to you boat, depending on which side of the wake you prefer to jump. They require a tsunami pump (not included) to connect to the fill fitting, then you drop that tubing overboard, turn on the pump to load up the bags with water. The tsunami high flow pump is one of the best portable pumps on the market and is also easy to use and very efficient. It pumps about 167 pounds per minute, and no hole or hard wiring is necessary to set up with the ballast bags. The only power required is a 12V socket/cigarette lighter, standard on every boat. The other option to fill your wakeboard ballast bags is to hook them up to a reversible pump, which is a more complicated installation. 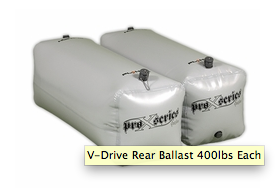 Pro X - 750 lbs: This is the biggest individual ballast bag we offer, good to add 750 pounds to your boat! Like we said, it's big, so make sure you consider where it will fit on your boat. For V-drives, the Pro X typically fits in both the rear compartments and you can also put the bag on the floor or the seats too. Adding this bag is like adding 4 adults to your boat - definitely going to boost your wake. V Drive Rear Ballast - 400 lbs: Sold as a pair of 400 lb bags, the rear ballast bags are made to fit in the rear side compartment areas of a v-drive, but can be used anywhere on your boat too. A total of 800 pounds will give you serious weight in the back of your boat. 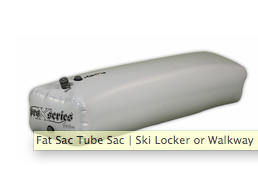 Tube Sac - 370 lbs: The tube sac is narrow in width and height but long in length designed to give you additional weight in your ski locker or center walkway. But depending on your boat, the tube sac's dimensions give you the flexibility to put it in a lot of different placements. Grab 2 and put one in your ski locker and one on top of it! All Fat Sac Ballast bags are made in the USA.